Last year I convinced Atom that we should spruce up our kitchen. 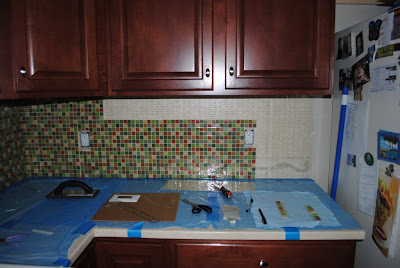 At first I proposed adding a glass tile backsplash. 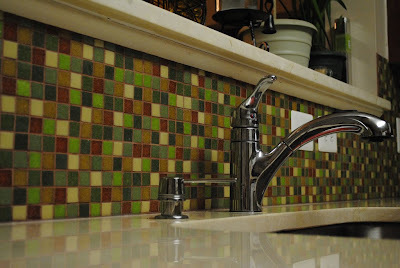 I had found a company that did custom mosaic tile. You just choose the colors and they mix them up and send them to you. After I showed Atom my proposed color combination, he was on board. The hubby surprised me when he suggested that we go ahead and get new counter tops as well. I had mentioned them a while back, but since he was getting a nice Christmas bonus it was now in our budget. We actually got the counter tops first. We had a few different companies come out to give us some quotes. 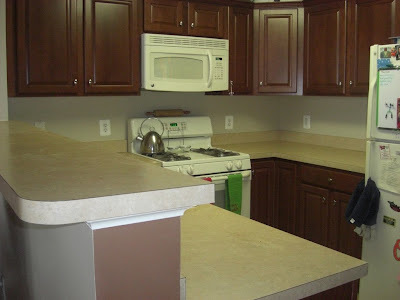 We actually got a quote for recycled glass counter tops (which we were absolutely in love with), but they were double the cost of the granite. We decided that we'd get those in our future home, but for now we'd go with industry standards. We are trying to sell this place in a few years so we have to keep the buyers in mind. Once we found the lowest bid, we went to the warehouse to choose our slab. 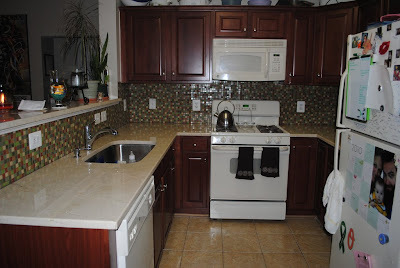 Initially we were going to go with the Santa Cecilia, but once I brought the tile sample and our kitchen cabinet, we decided it was too dark and busy looking. I spotted a beautiful creamy slab and had to investigate. Once we held up the tile and the cabinet, we were sold. 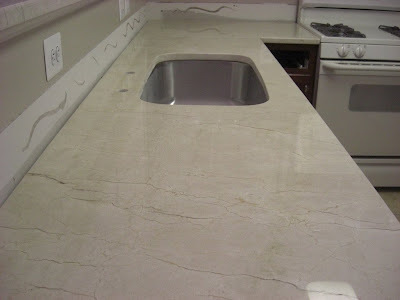 We actually chose a marble slab in Crema Marfil. It is absolutely gorgeous. The company came out just before Christmas and installed them in just a few hours. 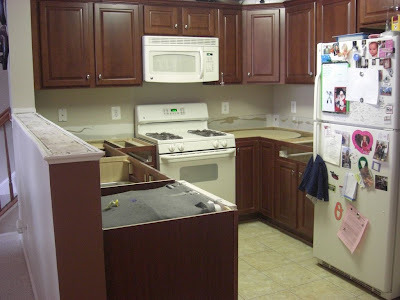 Here is what the counter tops looked like before: Here is what kitchen cabinets look like without a counter top: And here is what our new counter tops look like: Notice that incredibly large sink. I LOVE that sink. It is HUGE. I initially wanted a double bowl sink, then I saw that massive stainless steel beauty. It is 31" long and 9" deep. It is fabulous. OK, enough about my wonderful sink. 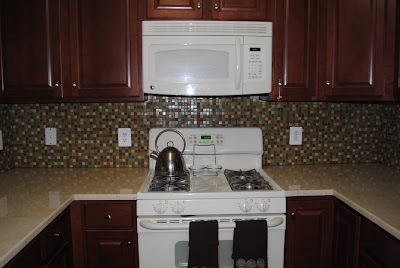 Next up was our tile backsplash. Once we received the tile, we headed to Home Depot to pick up supplies. They didn't have the color of grout we wanted so we had to special order that from a tile store. We did pick up the other tools needed. We decided to try this wall adhesive called SimpleMat, because the sales associate recommended it. We weren't 100% sold on the idea that it would work with our size tile. Atom emailed the company and they told him it would be perfect for our project. LIARS. 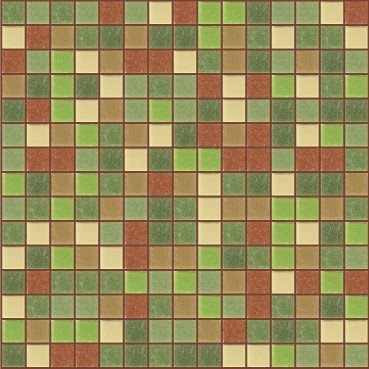 I'm not going to go on a product rant, because this probably would be fantastic for larger tile. It is not however perfect for sheets of tiny tiles. Unfortunately, we did not realize this until after we started installing it. That was not our only problem. I apparently do not know how to properly measure square footage, so I did not order enough tile. I had to order 3 more sheets and it cost a little extra because it was a small order. 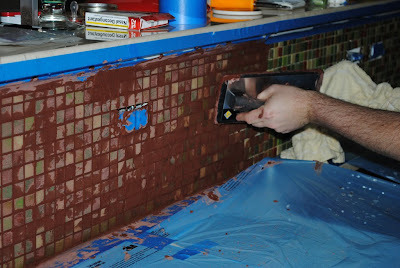 Once we got the 3 sheets and installed them, we began the grout process. I chose a terra cotta grout. I didn't want to drown out the color of the tile with a white or light cream grout. In true Shock style, we ran out of grout. And since that was a special order as well, we had to put an order in for another bag of grout. Luckily it was not as expensive and came much more quickly. So in the middle of the week, we finally finished. 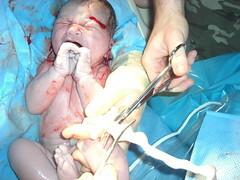 So, the million dollar question...would we do it all over again or hire a professional? As great as it feels to do things yourself and save money, we really do understand why people pay the professionals. In hindsight, we would definitely have used the thin-set instead of that tacky paper stuff. It would have been cheaper and easier. So in trying to make the job easier and less messy, it actually made it harder and frustrating. Next time I see that sales associate at Home Depot, I won't be asking him for any tips. The kitchen looks great and we are very happy with the results. The best part is that we are DONE.